As most of the UK settles into a rare snow filled excitement, we in Sheffield are still waiting with baited breath for a coating of the white stuff. Several friends are very upset that the stuff that brings the whole city to a standstill and fills our hospitals up with the elderly sick and the fallen fractured has not hit yet. Whilst I am not fond of the white stuff outside, I am delighted to play with some of the white things indoors. These are three successive years of lock creations by the "puzzle solving machine" that is Louis Coolen. Allard frequently has him stay over before and after an MPP and I suspect that he relies on him to solve half of his puzzles! I very seldom write about locks because I am frankly rubbish at them! My good friend Shane has been a locksmith as well as a Master carpenter for years and recently added the accolade of Master Locksmith to his list of qualifications. This means that he understands the damned things and seems to be able to solve them all with minimal struggle and even seems to have enough knowledge to manufacture his own (more of that later). If you do need a Locksmith in London and the South East of England then he's your man! Over successive MPPs I have seen and played with Louis' devices and to my shame up until recently only had a 50% success rate in opening them. Each year I passed on buying one for my collection because I had always spent my pocket money earlier (not that they were expensive). At the last MPP Louis had a set of all 3 available for the meagre sum of £15 each - my recent spending spree had inured me to the pain of bank account depletion and I couldn't resist 3 as a set! These puzzles are produced in the Shapeways 3D printer from WSF (White, strong and flexible) plastic which is a substance that is definitely Verboten in this house! I have 2 or 3 twisties made from it and they leave a trail of dyed black power over everything when I play with them which usually leads to an inevitable Whack! Ouch! These however don't really have much movement to be done and don't shed powder. At least that is what I have told the fearsome Mrs S.
The 2015 version is the original and by far the toughest - initially it doesn't even appear to be provided with a key! I recall working on this at an MPP and was only able to solve it with the aid of Louis and a chorus of jeering MMPers helping me. 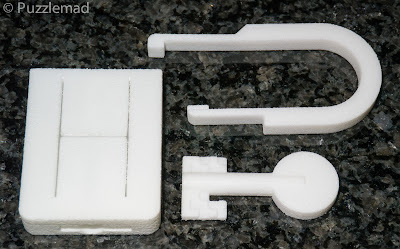 The solution requires just a smidgeon of force in places and that is where the WSF holds its own - it is really rather strong as well as flexible and of course.....white! With a little cajoling and help I was able to solve it there and to prove to myself that dementia has not set in yet I was able to solve it after I bought the trio of them in November. Only a hint of trouble and I had a nice open puzzle. 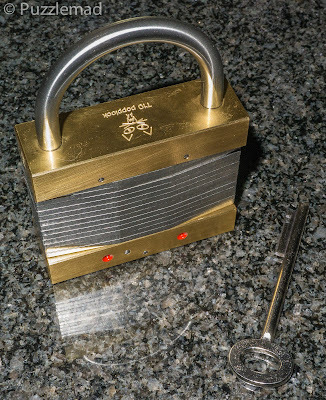 It needs at least 4 separate movements to open it and is a nice discovery sequence. It would appear that a copy has been manufactured in wood and despite not having the same material properties as the WSF it works beautifully. Everything is there for a particular reason and it does sort of lead you to the solution. Only 3 particular steps but very very clever indeed. I did remember how to solve this a year after my original success and still no white powder on our precious black granite surface. Now the 2017 Coolen lock was one I had not seen until it was available in November and I deliberately did not watch anyone play with it there. Having boosted my confidence with the first 2, I started on the 2017 version. Unlike Allard's copy, my key was not trapped inside but turning it revealed a couple of "interruptions" to the turning circle. Of course, no matter how many times I twiddled with it the turning never did anything. Taking out the key and looking at it and looking for other places to put it was also unhelpful. The only clue really was the strange shape of the keyhole. Time to think© which is something I am not very good at! After an hour or so of fruitless thunking, I had a bwainwave. What if I.......Aha! Things changed and moved. What if I now.....Aha! more movement and it stopped dead....Damn! I should have known Louis would put an extra step in! Of course I tried repeating the earlier moves but they weren't going to do anything. More thinking required no matter how painful. Something is definitely odd about that....maybe I can....what if I....Aha! Very clever that Coolen fellow! Perfect use of the properties of WSF and a very nice little sequential discovery puzzle. Again the mechanism is hidden from view. 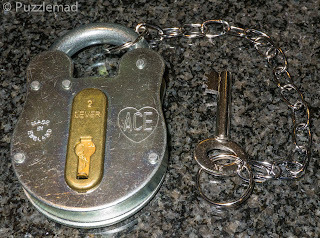 The shackle has been placed behind the main body for the picture above. 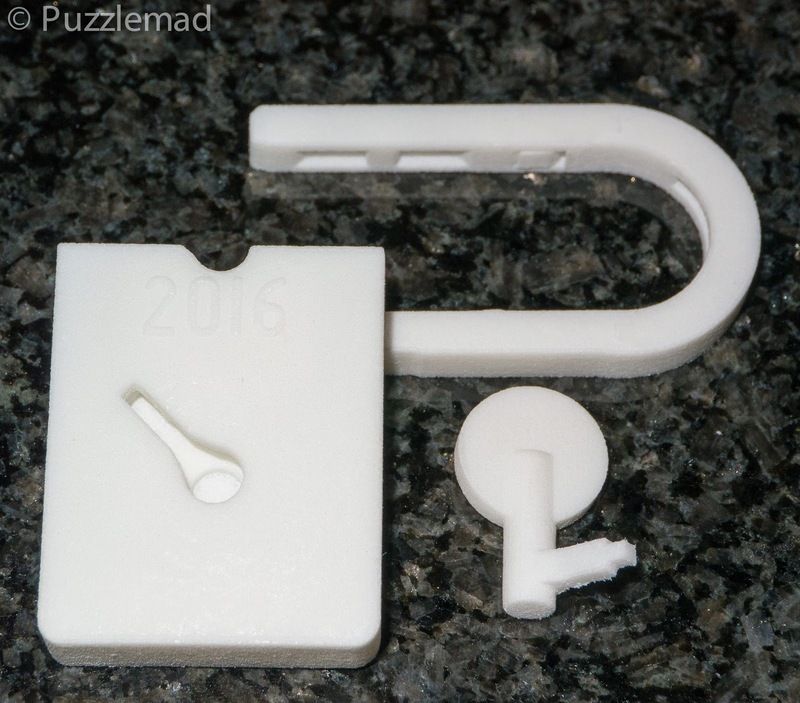 The wonderful 2017 lock puzzle is now available from Puzzle Paradise here and the older versions are available on request from Louis if you contact him using the Paradise messaging system. They are inexpensive and Louis will even consider puzzle swaps if you have anything of interest to him. Next up is a puzzle that I had to get a copy of, the B-Lock by Boaz Feldman. Yes that name is very familiar! Boaz is the son of Dan Feldman maker of the incredible Danlock. Boaz learned a lot from his dad! He also seemed to have learned a few new tricks. 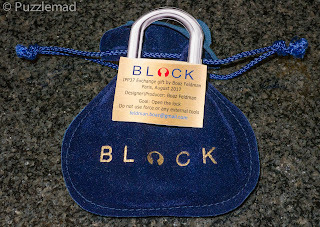 The B-Lock was exchanged by Boaz at the IPP and many of us were desperate to get a copy later. I was accused by a good friend who is not a puzzler (but was accompanying one) of behaving like a druggie with Boaz as my "dealer" at one point when in a corridor of the hotel I sidled up to him and made a casual enquiry about getting hold of his "special thing". Luckily for me Boaz came through with the "good stuff" the following day. 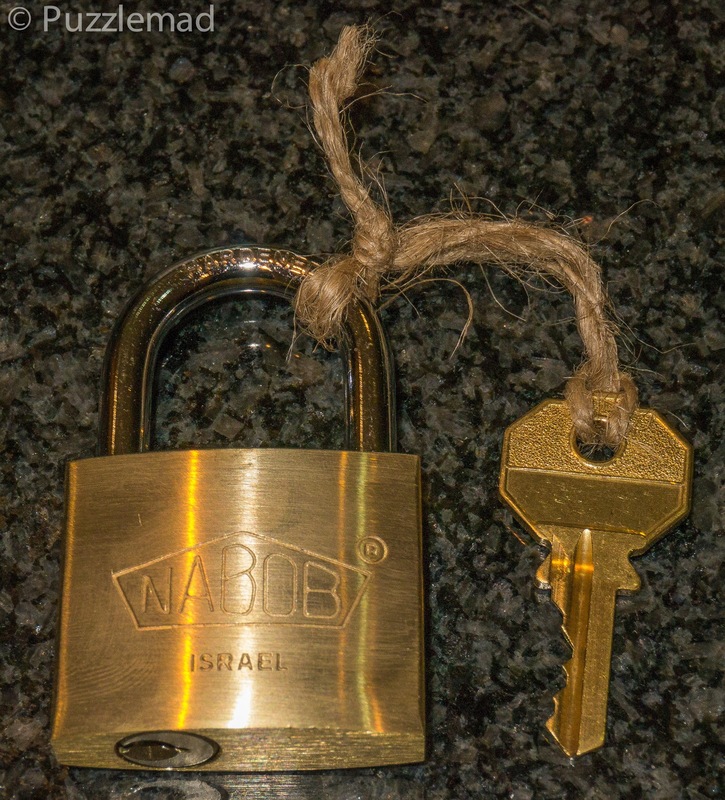 Looks like a standard Israeli padlock? It is. I saw this being solved at the IPP dinner and so never got to try it from scratch myself. 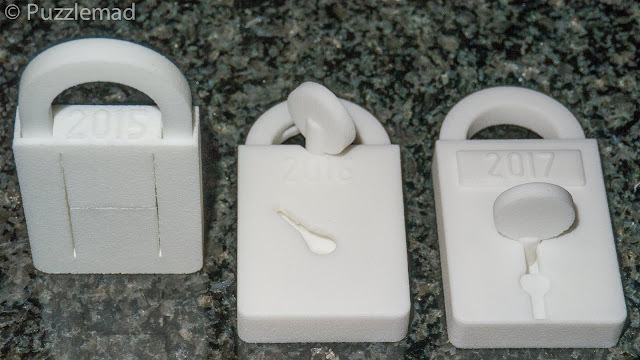 I seem to be unable to forget the solution method but every time I go through the process of opening the lock, I marvel at the incredible machining skills that Boaz has developed to carry out that incredible modification with such subtlety. 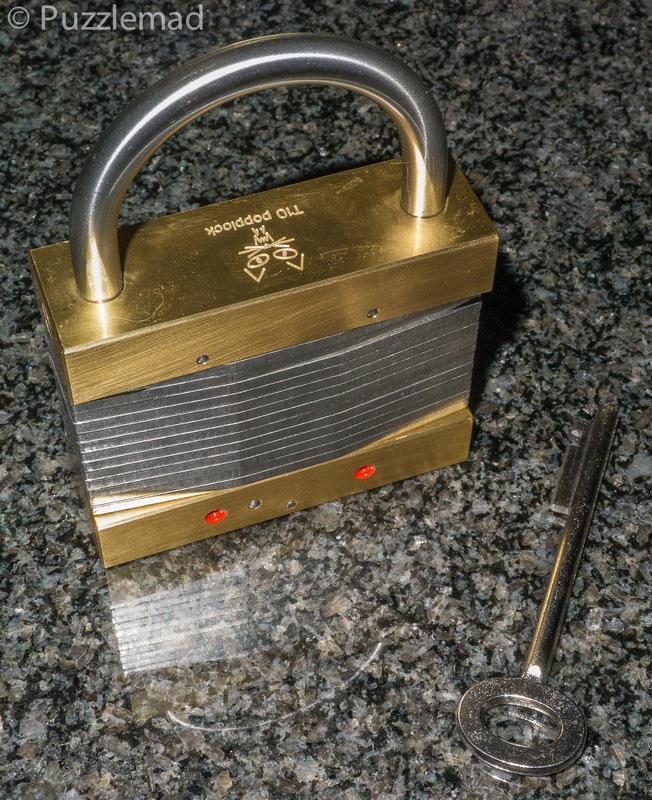 You need amazing eyes to notice the teeny tiny thing that is required to open this lock. I cannot wait for the next puzzle he produces. After this I have nothing but pain!! Shane's most recent creations have so far completely defeated me! 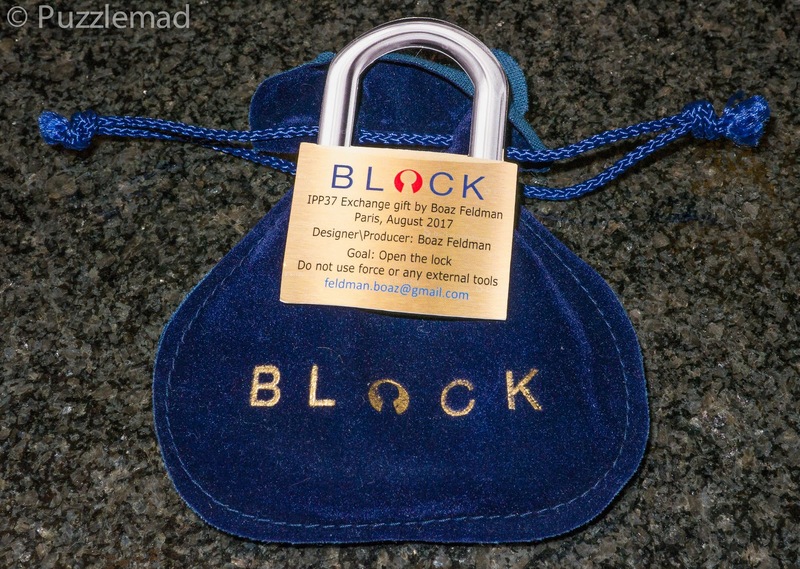 Haleslocks 3 and 4 were the IPP exchange gifts of my friends Peter Hajek and Allard Walker and hence 100 of them were handed out in Paris. I had planned to purchase a copy from the creator or the 2 humble gentlemen at the puzzle party (I was an exchange assistant only and so did not participate in the receiving part of the exchange, only in the record keeping and the repair of my exchanger's puzzles). At the end of the exchange I was truly grateful when Shane sidled up to me and handed me 2 nice heavy metal objects! This meant I had money left over for the party the following day! Oh boy! I certainly used all of that! So far I have worked on both of these for 3 months and got absolutely nowhere! I did find an unintentional shortcut in Haleslock 4 but this was so obviously trivial that I knew it could not possibly be the solution. I have 2 little brown envelopes sitting in my drawer that are enticing me but so far I have held off opening the solution - I am not sure how much longer I will last! 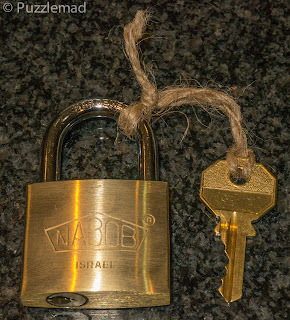 I just don't really understand locks very much apart from the very basics of a mechanism. 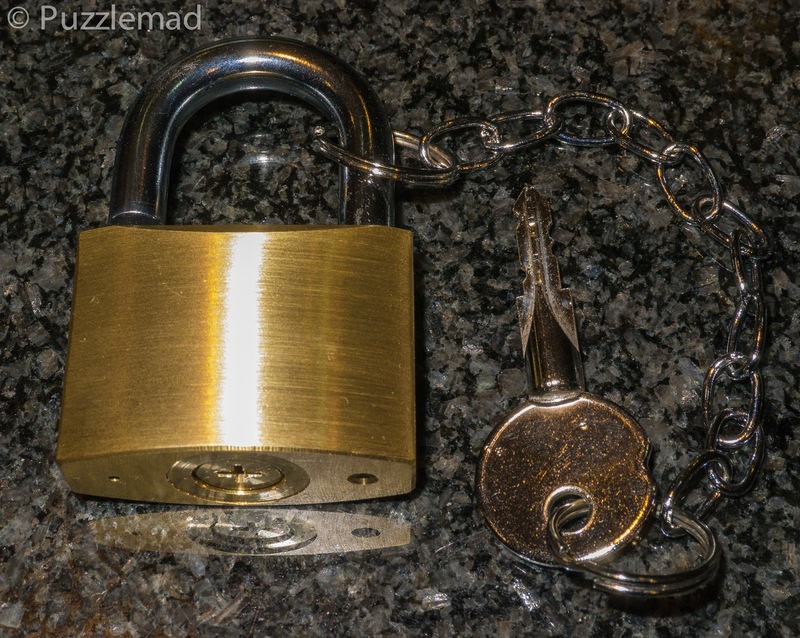 Shane is not the only Puzzle lock maker who has me beaten! 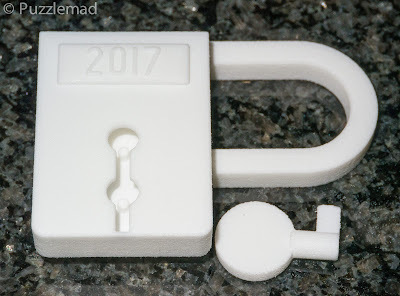 I have been working on the Popplock T10 for a year and still not got the damned thing open! It sits on my desk throwing insults at my puzzle manhood! I look at it sadly and have to admit that it has me beat....I am a puzzle wimp! I cannot wait for the T11 to be released. I got a look and a hold of a copy at the IPP (it was a delight to finally meet Rainer) and apparently it is incredible. For a preview photo have a look at Goetz' page. It will be significantly expensive but I cannot wait! Whack! Ouch! Oh well, I'm only going to live once even if it might not be for very long now! Mostly they need to be bought from their designers. They are extremely limited in numbers and hard to get. Some people manage to get them in puzzle auctions.